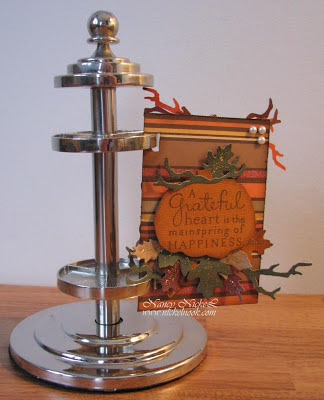 The Nickel Nook: Happy Thanksgiving with my first ATC! 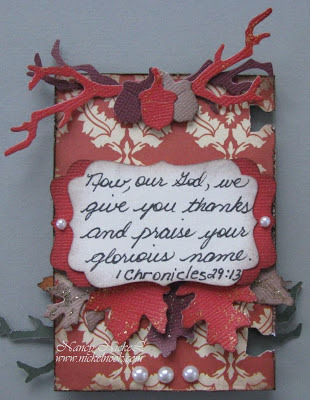 Happy Thanksgiving with my first ATC! Happy Thanksgiving wishes for all my friends to the south...and to everybody else, as well! Here in Canada, we celebrated our Thanksgiving in October. I consider EVERY day a Thanksgiving, so I'm celebrating along with you! God is so good, and He blesses us beyond measure! Pretty projects Nancy~ You are well deserved to get that sweet gift from your friend... All those cards are gorgeous and love the saying on them.. Yes, here in Hawaii we are going to celebrate our festive meal with family and friends.. Enjoy your lovely day and upcoming weekend! Hi Nancy Oh my your Atc Card looks fabulous. The colours are so beautiful. The card stand is stunning. and perfect for your little cards. Great job !! My creative friend. Great job, Nancy. I love all the rich textures and layers. It's dimension gives it a real heart-warming touch. Thanks so much for sharing with us again this week at Word Art Wednesday. We are blessed to have you play along with us, and I just LOVE seeing your beautiful art! 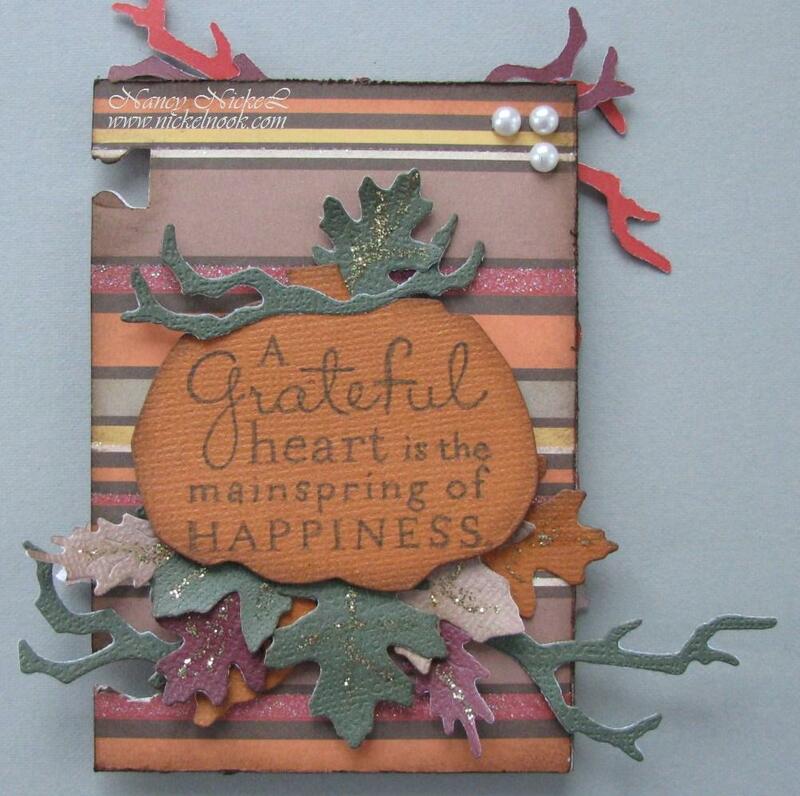 Beautiful ATC Nancy and a great start for your ATC holder :) Love those darling little acorn die cuts ! Wow Nancy, your creation is marvelous. I love the style of your great ATC, love love love it. The colors are amazing and your work too. I wish you a great weekend my gorgeous friend. Congratulations on creating such beautiful work on your first ATC. I love that scripture from Chronicles and have used it in various situations: teaching, prayers, etc. Beautiful work. Nancy, this is wonderful! I love the punch and the scripture you've shared! Enjoy the day! I love this, Nancy! We've had a great day with family here today...and beautiful weather! I've thought of you and several other blogging friends that I've never met, but am so thankful to have in my life! I do appreciate you and your bold faith...and your eagerness to share it through your beautiful artwork! Thanks so much for your friendship! Just think of the inspiration your beautiful stand will be when it is full of sweet little pieces like today's!!! Oh My! YOu are off to an amazing start my Friend! Look at that harmony of colors and yummy texture! Nancy, I really like those rich colors and all the lovely shapes. Pearls and falling leaves, who could believe they go with more than the little black dress? We so appreciate you sharing your projects with us at WAW. Oh, yes!! I think that you should continue with the ATC's. Did you have fun making it? I do like ATC's. Have you ever gone to the website Roses on your table (something like that). They have swap groups and I used to belong to an ATC one. Yep, I can do those. Wow, great ATC front and back!!! Nancy, your ATC is fabulous!! Can't believe that it's your first. Such pretty autumn colors and I love all the die cuts. Thanks for sharing with us at Word Art Wednesday this week. Can't wait to see your next creation for your holder. Nancy...thank you so much for supporting me over at the Precious Remembrance blog...I appreciate that so much!!! Have a great day!!! This is beautiful Nancy! It's a fantastic idea ,your stand is going to be wonderful when it's full.I love the way you always use the perfect scripture for your projects.Will have to join in this one too ! very pretty...look forward to seeing your finished stand! I've seen one of those stands before and could not figure out what it was for. It is to hold awesomeness is what it is for! I love your first creation. Bright fall colors and leaves. Eye catching little gem that it is. 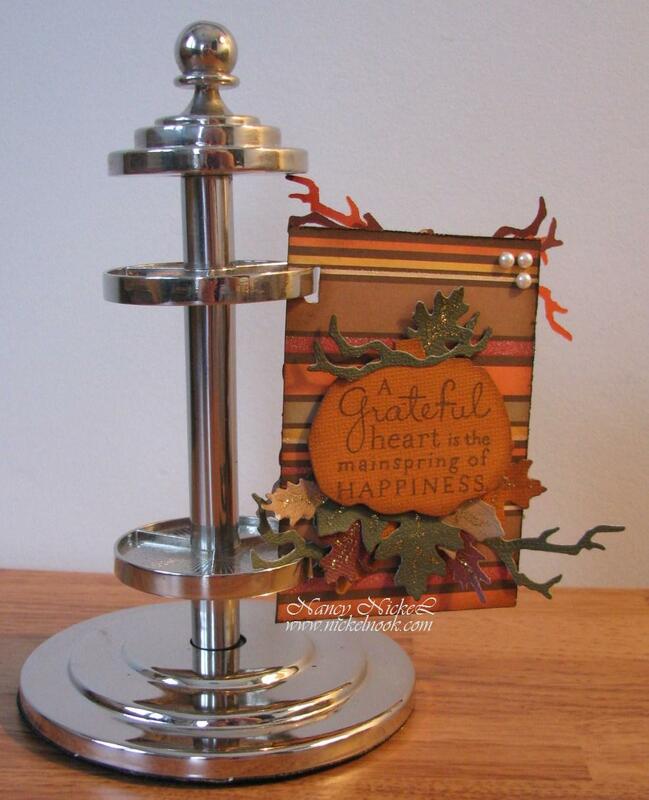 Oh Nancy, I love this little card and it is so beautiful and the stand is just wonderful. I have also thought about doing this. You may have inspired me. Nancy, I am sorry I had not discovered this sooner.... my life has been on a little roller coaster lately. Your ATC is a wonderful small piece of artwork. Thank you so much for taking part in my challenge... bless you dear sister-in-Christ.